Senior Tiffany Holmes reads the coverage while looking for a lane. The girls’ basketball team finished of their season strong with a 67-27 victory against Blair that brought them to a 7-3 record and a second place finish. At the opening of the game, the Tigers were clearly confident that this matchup with the Vikings would go their way but they started off on the slower side all the same. This stagnation was fortunately short-lived and the Tigers soon got their heads in the game, rapidly leaving the Vikings behind. The Tiger were relentless on the offensive side, with junior Lauren Kafkaloff scoring 14 points and junior Flannery Clark scoring 12. Kafkaloff, senior Tiffany Holmes and junior Kelly Mirhan reigned supreme in rebounds, claiming 9, 6, and 5 respectively and helping to keep the ball on their side of the court. This marks the end of another mostly successful league season for the Tigers. When the season began on January 10, the team got off to early success, beating San Marino 44-28 and Monrovia 70-43. However, they soon faced greater challenges and defeats at the hands of Temple City and La Cañada in a pair of intense neck-and-neck games. Later in the season, the Tigers met up with those teams for a rematch, and though they still fell to the Spartans, they dispatched the Rams in a 40-37 nailbiter. Though this and the victory over Blair brought their league record equal to Temple City. Now, the Tigers have one final challenge: CIF competition. 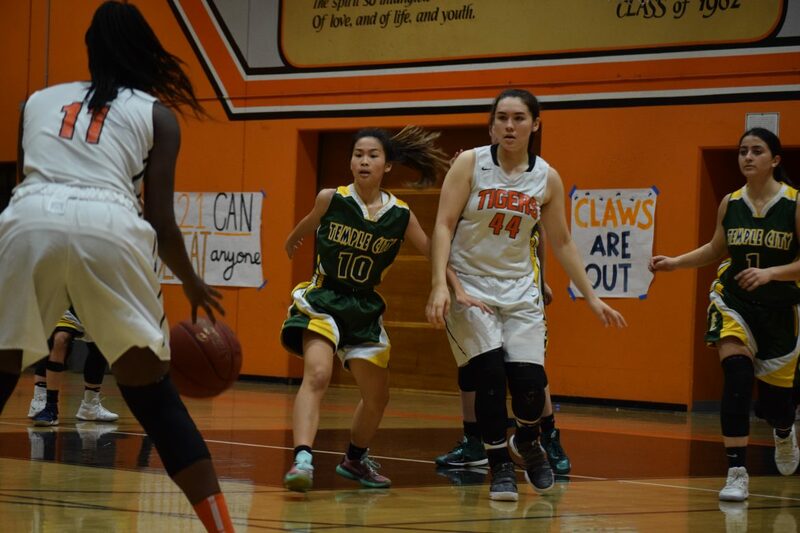 On February 15, the Tigers will face off against Chino at home, beginning the final leg of their season. Senior captains Tiffany Holmes and Naomi Kruzic must lead their team through one last tournament against schools from across Southern California. Though the Tigers’ league season has finished, their games are far from over. For most of his life, Ben Clark has been fascinated with telling stories. From a young age, he has written his own short stories and films, but recently he has begun to tell stories through journalism as well. Now as a member of Tiger Newspaper, Ben is committed to sharing the real stories of the world with his peers. Girls Varsity Basketball finished tied for 2nd place in Rio Hondo League. Please update the article as the team worked very hard for the win. Thank you for covering the game based on maxprep but the ‘standings’ tab is not the official Rio Hondo League record. The 2015 SPHS Boy’s varsity team tied for first place 3 years ago so I know that teams are allowed to tie if the records are equal.